“Sshhhh, Be very very quiet. I’m hunting wabbits” said Elmer Fudd when he was on the look-out for Bugs Bunny. 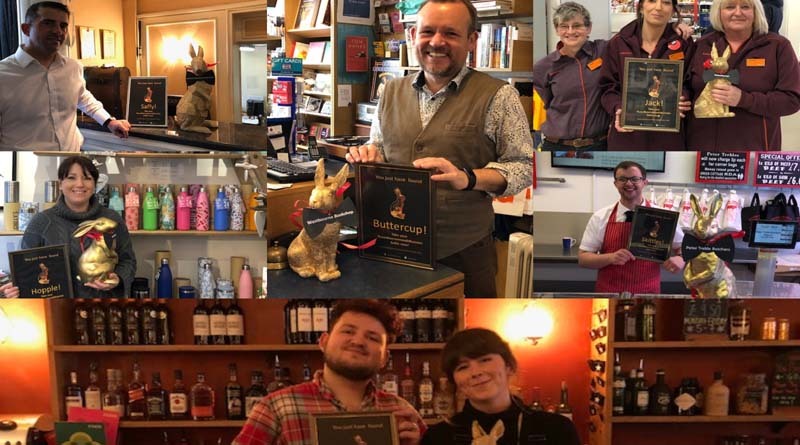 In the run up to Easter hundreds of people will be joining Elmer Fudd, not looking for Bugs Bunny but for the coastal villages’ 25 golden bunnies who are hopping in and out of shops, hotels and restaurants all over Westbourne, West Cliff, the Sea front, East Cliff, Boscombe, Pokesdown, Southbourne and Tuckton. Wannabe Elmer Fudd’s have from now until the 27th April to find the bunnies using clues that can be found on the Bournemouth Seasons Facebook and Twitter pages for their chance to win £100. To enter, participants simply need to take to take either a selfie or a photo of the bunny and post it on social media with the hashtag #LoveBournemouthBunnies and they’ll be entered into a draw to win a number of prizes. The Love Bournemouth Bunnies is now in its third year, with hundreds of people involved in the adventure through Easter 2018. This year, a whopping 126 businesses are involved in the competition which provides families with a fun opportunity to explore Bournemouth’s coastal areas.